It is natural for English teacher Pat McIntyre to teach about Orwell and Salinger, but she also has a natural impulse to highlight composer Antonin Dvorak. Finding a place for musical education, beyond the setting of simply music classrooms, may be easier and more beneficial than one would think. Not all students are often given the opportunity to explore music and enrich their appreciation and understanding. McIntyre, an English teacher at West High, believes in the importance of music in all disciplines of learning. She has worked with the Kettle Moraine Symphony Orchestra since 2012 creating curricula for grades K-12 to integrate music into non-music classes. Her title is Director of Educational Outreach. The curriculum is posted on the Kettle Moraine Symphony’s website, and is a free resource available to everyone. The mission of the program is to “increase awareness and open musical opportunities to people who are not aware that we have an outstanding orchestra in the Kettle Moraine area,” McIntyre said. McIntyre, who has a degree in curriculum development, looks at the concert season for the symphony and she then develops lesson plans involving themes of the music, history of the time period of the music, cultural aspects of the music, and more. There are lesson plans for all grade levels that strive to make connections between the music and each subject area. 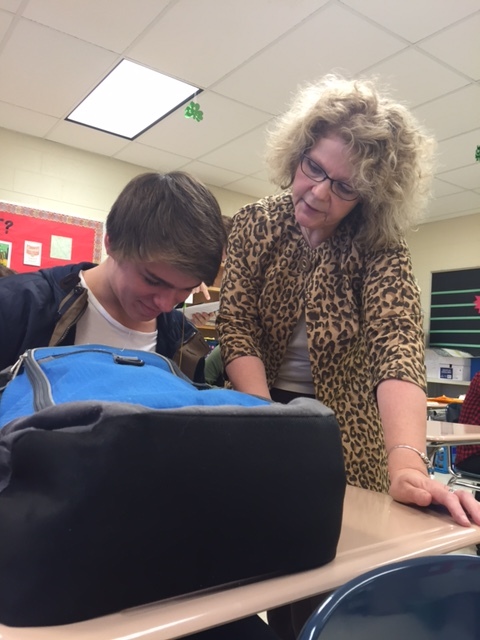 Pat McIntyre helps Matt Lacey, West junior, during resource time. “The lessons are standards-based, which is important in our world of accountability,” McIntyre said. “There are many children who are not particularly interested in school. Let’s be honest, math, science, social studies, English can sometimes be difficult for children to understand, but most people respond to music,” McIntyre said. She states that music can serve as a hook to get students interested in a subject area they normally would not be interested in or otherwise understand. An example of a lesson plan created by McIntyre focuses on Antonin Dvorak’s composition for the 1893 World’s Fair in Chicago. The unit explores the planners’ task in achieving the fair, including financial, architectural, and real-estate matters. This prompts social studies students to debate the ideal location for the fair. Students must place themselves into the world of 1893. West senior Brenda Lindstadt and West junior Sarah Fleischmann are both students in the high school band who have helped McIntyre with outreach programs. Fleischmann looks to science to prove the importance of music within the education of children. “Music in general is scientifically proven to make kids smarter, at least temporarily. Listening to instrumental music increases brain productivity so any time that you can listen to music, especially instrumental/classical, it shows that it helps kids in their studies, in their social skills, in their analytical skills, and in their creativity,” Fleischmann said. Fleischmann also emphasizes that an appreciation for music early in life must be nurtured, simply because of the positive effects it has later in life. “I think that music is important because when you first enter high school the first thing you hear is the band, because they always play on the first day, and when you leave it’s the last thing you hear because they play at graduation. And I think that band is really important because they kind of set the soundtrack for your high school career and if you don’t have that, you’re just empty,” Lindstadt said. “My heart says every child should be exposed to music of all kinds, the classical music, the pops music that we do at our pops concerts… and there is something very exciting about seeing a full orchestra and experiencing live music,” McIntyre said. What McIntyre foresees is a universal participation in music, regardless of talent. “I hope to achieve an increased participation of young people in music programs and to establish connections between the teachers throughout the school district in all of the disciplines with the Kettle Moraine symphony,” McIntyre said. “If we did not have music in our school, you would not have all these great things like the drumline performances, and I think that is really important when [students] enter band that they feel like they are in a community. 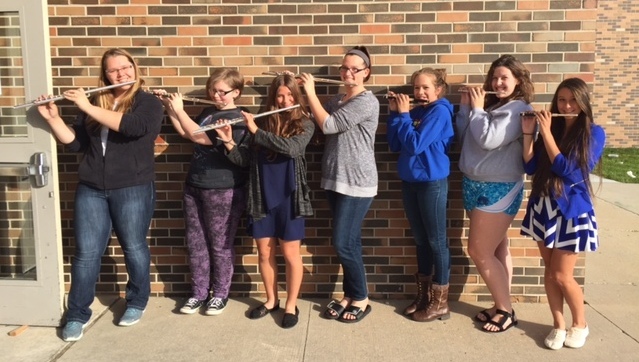 Even if they don’t have a sport, band is a community and we are just like a sport,” Lindstadt said. A goal set forth by the superintendent and the school board found on the district website is to “increase student engagement in the arts, athletics, clubs/co-curriculars annually,” and McIntyre’s lesson plans are linked to that goal. “Many people who are not musicians or vocalists don’t feel comfortable in that realm, so by providing them with lessons that are already made, and a resource person that they can call, being me, hopefully we will establish that connection,” McIntyre said. Thank you for writing this article! I am so proud of the Interact Club members, as well as the band and orchestra musicians who have been indispensable to the Kettle Moraine Symphony Educational Outreach program! Ms. Mac is an outstanding example of a teacher, like so many we have in our district, that goes above and beyond to make sure that our students have so many opportunities to learn and grow. Thank you Ms. Mac for giving children today yet another way to have music integrated into their lives. The arts are such an important avenue of growth and expression for young minds.